Trip to Calpe, 22nd to 29th November 2008. 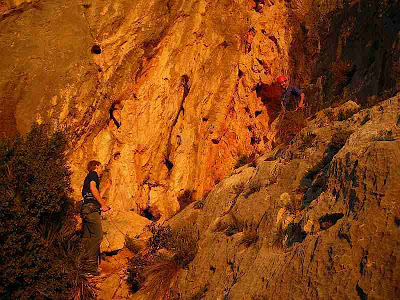 AndyC, AndyG and Richard flew out of Liverpool bound for Alicante on the morning of Saturday 22nd of November for a week of sun, sand, sport climbing and some adventurous trad. Saturday 22nd, Toix Far Oeste. 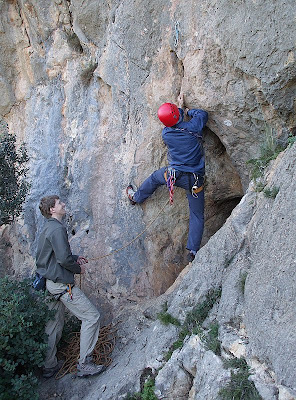 After a short drive along the motorway in the hire car and a stop in Altea to buy some lunch, the team headed to the easy single pitch crag at Toix Far Oeste for a warm up in the pleasant afternoon sunshine. Route of the day was definitely Richard's ascent of Energico 18m 1* F6a+ (Bolted) up a slightly overhanging tufa groove, leading to very thin moves on the final slab. 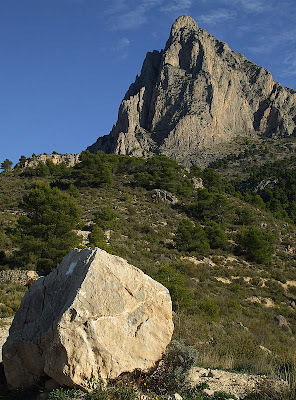 Olta is on the side of a high plateau overlooking Calpe. 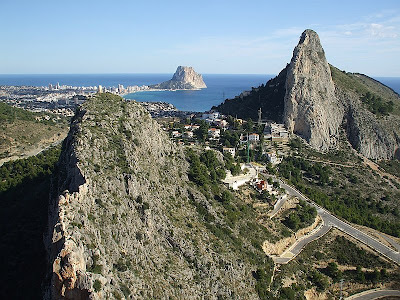 It is the home of Tai Chi 26m 3* F6b+ (Bolted) which also lays claim to being the most photogenic route on the Costa Blanca. After a brave lead with just one rest from Richard, the rest gave it a go on top-rope and posed for photos. 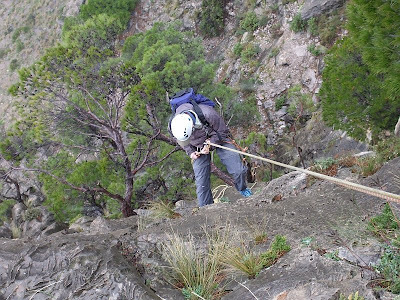 Monday 24th, The Mascarat Gorge. 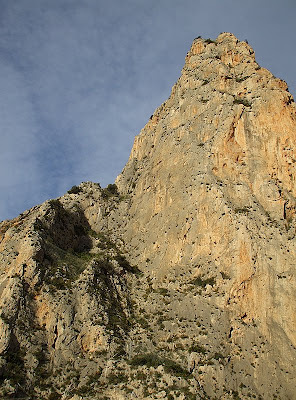 This is a big one, Llobet/Bertomeu(formerly known as Via UBSA) 276m 3* F5+ (HVS) (Trad with some bolts) up the Aguja Superior. 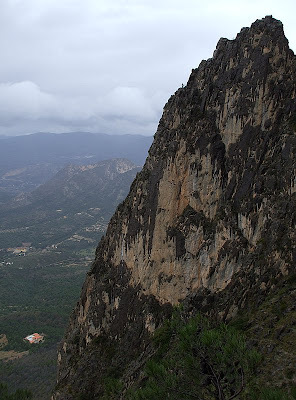 The Mascarat Gorge cuts through the seaward end of the Bernia Ridge, separating it from the craggy ridge of Toix which leads right down to the sea. 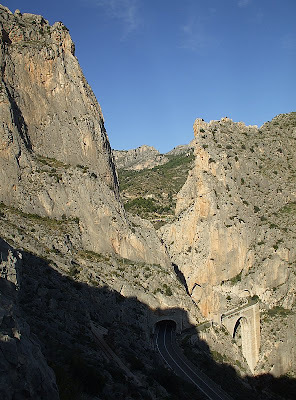 The motorway, the main coast road and the railway all cut through here using a variety of bridges and tunnels. 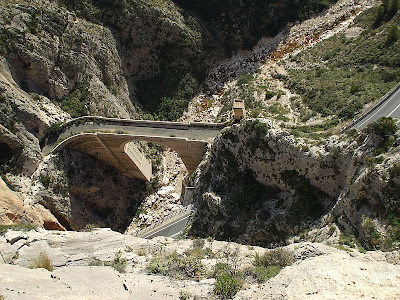 Climbing the route requires special care not to dislodge any of the abundant loose rock on to any of the transport infrastructure below. 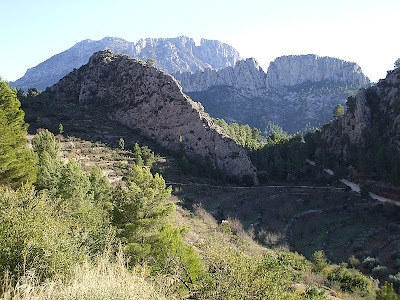 This was an easy day with a trip to Finestrat to find the route to the Puig Campana ready for an early start the next morning. Since AndyC and Richard had not been before, they were given a tour of Echo Valley. Due to the cold wind on the higher crags, it was decided to climb on the smaller crag of Echo Playa which was still in the sunshine. 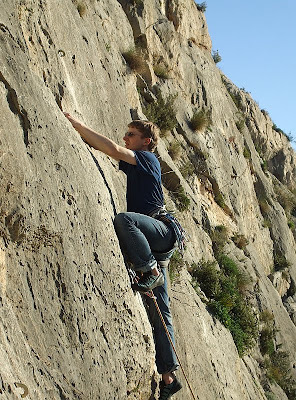 The most enjoyable route was undoubtedly Basilius 16m 1* F5+ (Bolted). 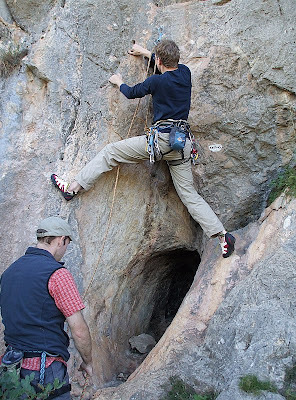 An imposing and slightly improbable looking start, surmounting bulges above a cave leads to really nice climbing on strange crystaline protruberances up a steep slab. This was going to be a really big one. Espolon Central 450m 3* F4+ (HS) (Mostly trad, some fixed gear). 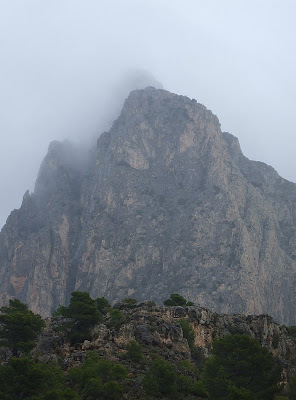 However, after leaving Calpe at 6am, it rained on the approach and when the dawn broke it became apparent that it was much cloudier than the previous few days. 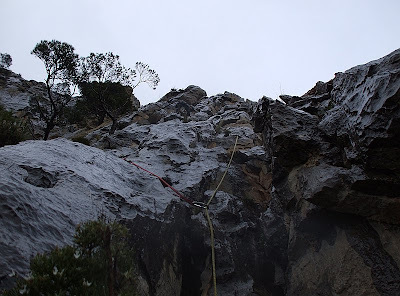 The first three pitches were soloed easily(120m F3). 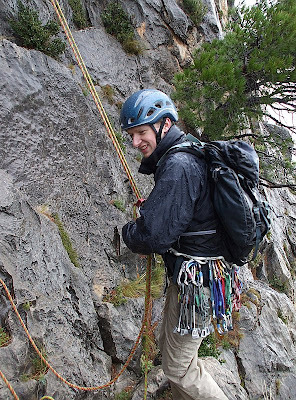 Then despite more persistent drizzle AndyG led the next three pitches(90m F3, some scrambling, F4). By this time the drizzle and turned to sleet and there were definitely snowflakes blowing in the wind. 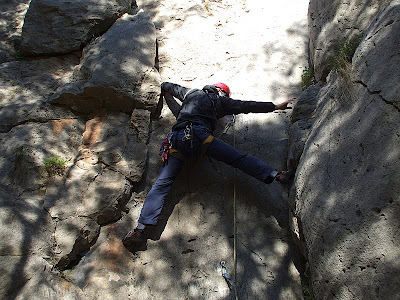 Richard led the next pitch(supposedly 50m F4, but really only about 35m) to a belay near a well equipped abseil station. After three abseils and one jammed rope, eveyone was safely back down. Beaten by the weather on this occasion but a great route to go back for. Thursday 27th, Dalle D'Ola and Toix Este. Another rainy day. It started as soon as the bags were set down at the bottom of Dalle D'Ola, high in the Altea Hills housing estate, below the Bernia Ridge. 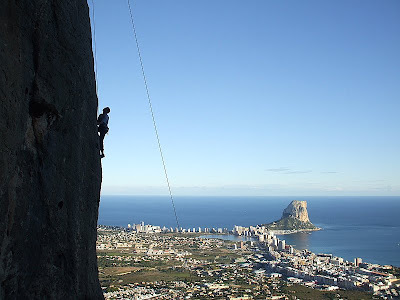 After a trip to Toix Este in search of more sheltered conditions, which didn't work out because the wind was howling off the sea at Toix, climbing was abandoned in favour of exploring Calpe Old Town. 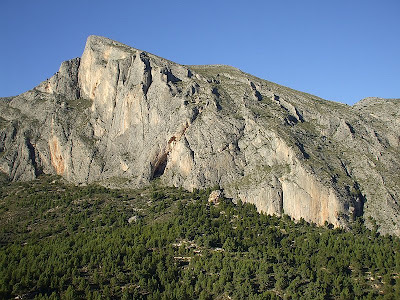 Despite Rockfax claiming that most of the crags are well sheltered, it was very windy around Sector Marion at Sella. 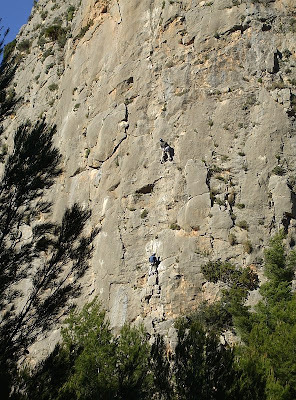 After trying to warm up on a couple of routes, AndyC and Richard did the first two pitches of Marion 3* (P1.24m F5, P2.22m F4) (Bolted), whilst AndyG kept warm by going exploring with his camera. After a well deserved lie-in and a leisurely start to the day, the chaps arrived at the airport just before noon, only to be told that the flight was delayed. It eventually left nearly five hours late, apparently due to disrupted schedules caused by fog in Liverpool. 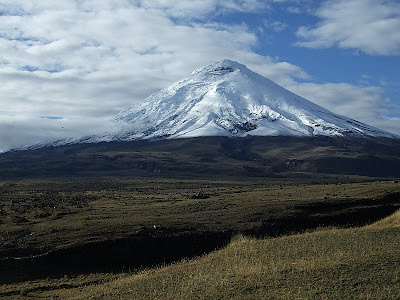 I recently returned from a trip to Ecuador organised by Jagged globe and led by Dave Walsh, who has, among many other things, climbed the 7-summits, ie highest peaks on every continent. 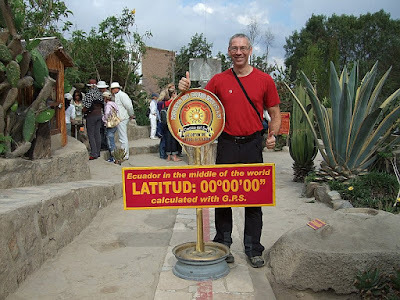 After and to aid acclimatisation, the first couple of days were centred in Quito and these two days included a trip to the equator and a city tour. We observed such wonders as the “plughole experiment” where locals tried to convince us that the Earth’s rotation influences direction of rotation of a stream of water as it exits a plughole at and on each side of the equator!. We also saw changing of the guard with the president of Ecuador looking on and visited various churches, one of which required climbing some steep and rickety steel ladders to get up the clock-tower – I have done easier via ferrata routes!! Who said that there is no cultural interest on my trips? 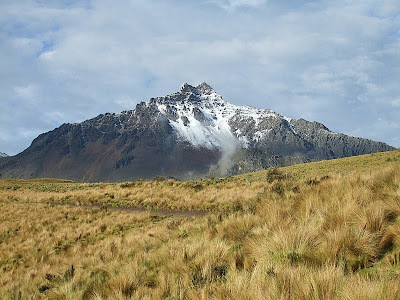 Following these two rest/recovery days, we then attempted to climb Pichincha Rucu (4,698m, PD). 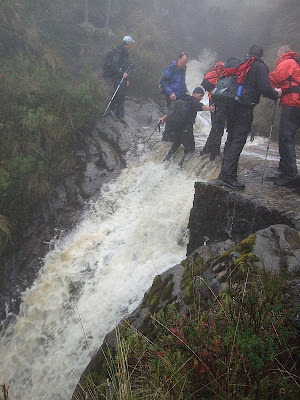 However, an electrical storm necessitated a retreat about 100m from the summit, followed by a long descent along a step, muddy and very wet path with the odd waterfall crossing as the teleferique was not operating. Next few days saw us in Cotopaxi National Park where we spent some time acclimatising and also training on Cotopaxi up to just below 5000m. 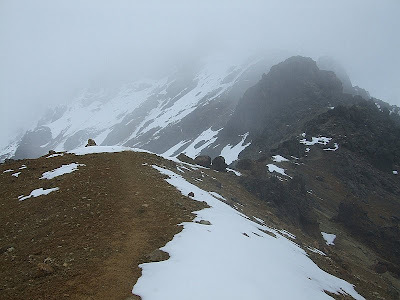 We then headed for Virgen Camp (around 3900m) prior to ascending Illiniza North (5,126m, PD). Frustratingly, we were again forced to retreat about 10 or 20m from summit because of an electrical storm and static build-up on summit. 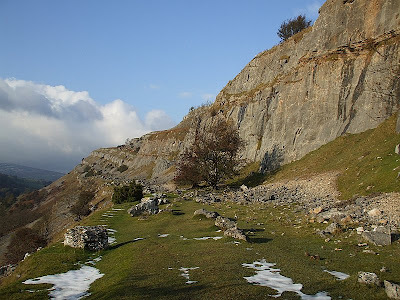 Two of our team were zapped by a static discharge from rocky summit, but were fortunately unscathed. Our local guides considered that there was too high a risk of lightning strike to hang around! The remaining days of the trip also required a change of plan. 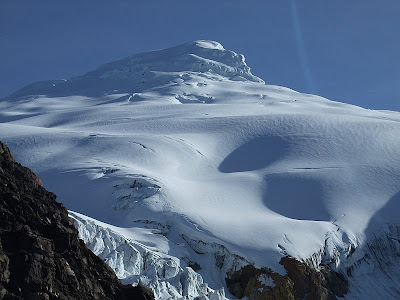 Our original objective, Antisana was deemed to be unclimbable because of deep snow and potential avalanche risks so we headed for Cayambe (third highest mt in Ecuador, 5790m, PD) as this was our best chance to reach a summit. We spent the first day ice climbing on the glacier (three routes, estimated to be around Grade IV), with some challenging bulges and overhangs to negotiate. The following day, an alpine start saw us on our way at 0100hrs on a bright, clear night. 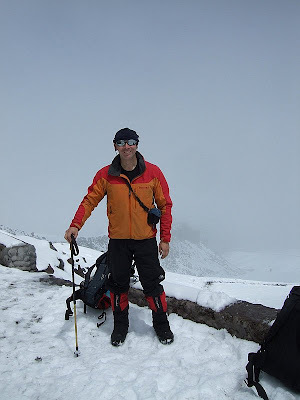 The thin crust of snow supported our weights well and we were hopeful when we reached about 5,300m. 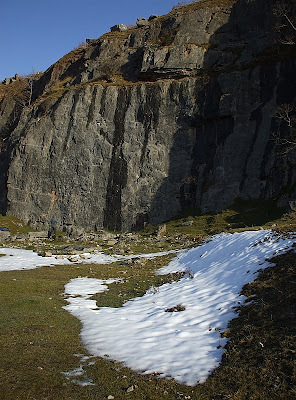 However, examination of snow pits revealed non-cohesively bound snow layers higher on the mountain. Yet again, we forced to descend due to the high risk of avalanches once the sun rose. Also of interest were some bird and mammal sightings – Andean condor, llamas, paramo wolf (sort of mid-way between a fox and wolf, as we know them), carunculated caracara and turkey vulture. All in all it was a good trip, despite zero summits achieved out of several attempts on high mts. A little photo-reportage from the weekend. 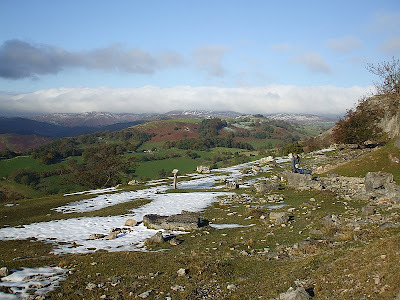 While some of us were enjoying the snow at Trevor Rocks, Graham was out enjoying lots more of the stuff in the Lakes. Looks like winter has come early this year. 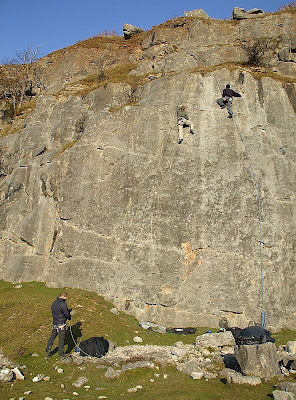 On Sunday Richard met Mark and AndyG at Trevor Rocks for a bit of late season sport climbing. 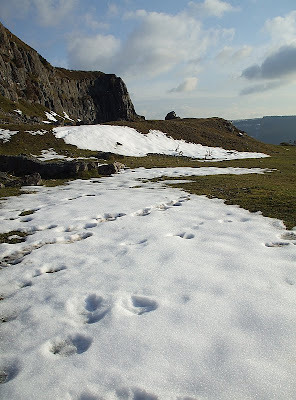 Much to everyone's surprise there was still snow on the ground despite the relatively lowly elevation and pleasant southerly aspect. 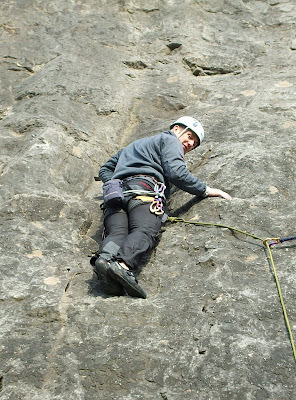 However, the rock was mostly dry and this encouraged Mark to try some hard stuff. Conditions were generally bright and surprisingly warm except when the sun was behind the ocasional cloud. 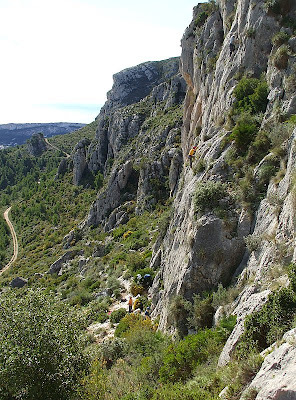 Equally surprising was the lack of many other climbers. 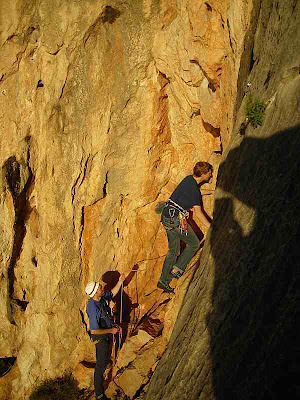 In the summer Trevor can be very overcrowded but we were joined by just one other pair of climbers and a soloist. After warming up on Over the Wall 16m F6a+ 1* which continues to be a little problematic at the last move, they moved on to Checkpoint Charlie 12m F6b 1*. Mark was determined to lead Margin of Error 12m F6c 2* but was unable to work out the crux sequence quickly enough to avoid getting pumped. 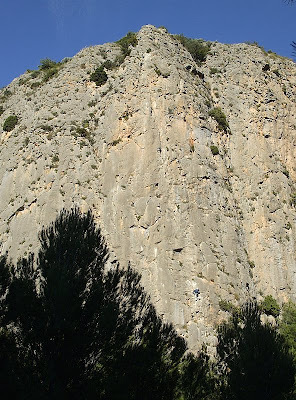 Finally, they finished with an ascent of Borderline 12m F6a+ 2* which has a nice combination of sharp holds on a steep wall followed by delicate climbing up a blank slabby groove.